RPGaDay Day #5 asks: What story does your group tell about your character? I have eternally made Dwarves Italian after a couple of entertaining games run in my ongoing Dragon Age campaign, does that count? I honestly can’t say that this applies to me because I don’t recall anyone ever talking to me about my character. Maybe I don’t run in the same sort of circles or something? I probably talk more about my own characters, rather than people talking about them. Even then, those moments of recollection only really come when I’m writing this sort of thing. I have memorable characters and memorable moments. I have Matt Houston, from by first ever Call of Cthulhu campaign, lying in a hospital bed, bereft of an eye, an ear, half his left arm and half his right leg. A private investigator with a number of investigations into the Mythos under his belt, his slow decline led him into cultism and his final act was to mutter a spell intended to summon an avatar of Azathoth. Curtain closed at the point, so I can’t tell you what happened next. 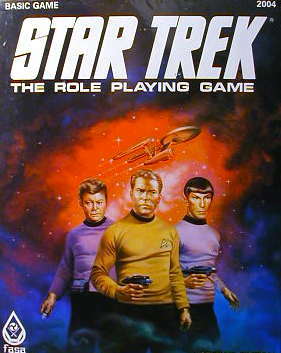 Or Commodore James Andrew Garth, who was demoted to Captain and assigned to the USS Lexington, running afoul of the Gorn in a crossover between the FASA RPG and the tactical starship combat game. The Lexington got destroyed – that’s all I really remember – but it happened with a lot of excitement, some dreadful command decisions and a final act that was either a ramming action or a slow fiery death in the atmosphere of the nearest planet. Does anyone talk about those moments?